International Ethical Guidelines for Health-related Research involving Humans. The CIOMS 2016 International Ethical Guidelines for Health-related Research Involving Humans are available in PDF format and printed copies. 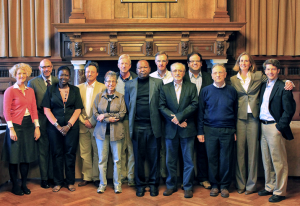 In 2011, the CIOMS Executive Committee decided to set up a Working Group to revise and update the CIOMS 2002 International Ethical Guidelines for Biomedical Research Involving Human Subjects, with an additional aim to merge them with the CIOMS 2009 International Ethical Guidelines for Epidemiological Studies. CIOMS, in association with WHO, started its work on ethics in biomedical research in the late 1970s. The World Medical Association had issued the initial Declaration of Helsinki in 1964 and an expanded version in 1975. The outcome of the CIOMS/WHO collaboration was titled Proposed International Ethical Guidelines for Biomedical Research Involving Human Subjects (1982). The period that followed saw the outbreak of the HIV/AIDS pandemic and proposals for large-scale trials of prevention and treatment for the disease. These developments, including research involving vulnerable populations, progress in product development and biotechnology, raised new ethical issues that had not been considered in former guidelines. The Declaration of Helsinki was revised twice in the 1980s – in 1983 and 1989. It was timely to revise and update the CIOMS 1982 guidelines. Working with partners such as WHO and its Global Programme on AIDS resulted in two sets of guidelines: International Guidelines for Ethical Review of Epidemiological Studies in 1991, and International Ethical Guidelines for Biomedical Research Involving Human Subjects in 1993. After several years, ethical issues emerged for which the 1993 CIOMS Guidelines had no specific provisions. They related mainly to externally sponsored clinical trials carried out in low-resource settings. The revision process was started and CIOMS organized a consultation meeting with eight commissioned papers. The revision process finished with the third version of the CIOMS guidelines issued in 2002. Changes in the environment also triggered the revisiting of the 1991 guidelines of epidemiological studies. In 2009, the new CIOMS International Ethical Guidelines for Epidemiological Studies was published. During its annual meeting in 2009 the Executive Committee of CIOMS considered the desirability of a revision of the CIOMS Ethical Guidelines for Biomedical Research Involving Human Subjects. Since 2002, several new developments had again taken place including the revision of the Declaration of Helsinki in 2008. In 2011, the CIOMS Executive Committee decided to set up a Working Group to revise the CIOMS 2002 and 2009 guidelines. The Working Group decided to broaden the scope of the 2002 guidelines from “biomedical research” to “health-related research”. The Working Group considered biomedical research too narrow since that term would not cover research with health-related data, for example. The Working Group also acknowledged that there is no clear distinction between the ethics of social science research, behavioural studies, public health surveillance and the ethics of other research activities. The current scope is confined to the classic activities that fall under health-related research with humans, such as observational research, clinical trials, biobanking and epidemiological studies. This group met several times, starting in September 2012. 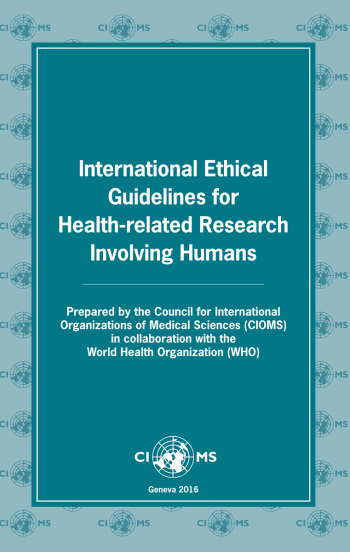 In September 2015 the Working Group opened its new draft CIOMS International Ethical Guidelines for Health-related Research involving Humans for public comments. More information about the revision process can be found here. Following the WG’s tenth face-to-face meeting, held in June 2016 in Utrecht (Netherlands), this web-posted final text was approved by the CIOMS Executive Committee during the XXII General Assembly of CIOMS on 29 November 2016.